Big box retailers are seeking to expand into major metropolitan areas in the United States. Elected officials and policy makers are struggling to understand the impact these retailers would have on their cities. Some cities are considering “living wage” policies that would establish higher minimum wage standards on retailers of a certain size. As the largest retailer and largest employer in the United States, Walmart’s expansion plans have attracted the most attention and focus from policy makers. To understand how a mandated wage increase would impact poor and low-income families, we need to understand both the size and distribution of any projected increase in consumer prices. We need to understand the economic status of Walmart workers and consumers and how an increase would impact each group. If most Walmart workers came from higher-income families and consumers from low-income families, a mandated wage increase might result in a net transfer away from low-income families. If the opposite is true, it might result in a net transfer to low-income families. In this study we update a previous analysis of how a higher wage standard would impact both Walmart workers and consumers, and how those impacts are distributed across income levels. We use a $12 per hour minimum as the hypothetical wage standard for the analysis. Our analysis reveals that establishing a higher minimum wage for large retailers like Walmart would have a significant impact on workers living in poverty or near-poverty. We find that 41.4 percent of the pay increase would go to workers in families with total incomes below 200 percent of the federal poverty level (200 percent FPL). These poor and low-income workers could expect to earn an additional $1,670 to $6,500 a year in income for each Walmart employee in the family, before taxes. Even if Walmart were to pass 100 percent of the wage increase on to consumers, the average impact on a Walmart shopper would be quite small: 1.1 percent of prices, well below Walmart’s estimated savings to consumers. This works out to $0.46 per shopping trip, or $12.49 per year, for the average consumer who spends approximately $1,187 per year at Walmart. This is the most extreme estimate, as portions of the raise could be absorbed through other mechanisms, including increased productivity or lower profit margins. While Walmart shoppers are disproportionately middle-and lower-income, the customers who spend the most at the store are somewhat less likely to come from poor and low-income families. We find that 28.1 percent of the total price increase would be borne by consumers in families below 200 percent FPL. In comparison, 41.4 percent of the benefits would go to Walmart workers in families below 200 percent FPL. In summary, we find that a Big Box Ordinance or similar legislation that raises wages would provide significant, concentrated benefits to workers, almost half of them in poor or near-poor families, while the costs would be dispersed in small amounts among many consumers across the income spectrum. In net, a wage increase for Walmart workers represents a transfer of income to poor and low-income families. Low-income Walmart workers would see a raise of $1,670 to $6,500 per year, while the average Walmart shopper would spend an additional $12.49 per year. Both the benefits to workers and the costs to consumers would be smaller in higher wage states and metropolitan areas. What if Walmart put in place a $12 per hour minimum wage for all its hourly employees in the U.S.? How much would it cost Walmart, and how much of the increase would benefit workers in poor and low-income families? In order to calculate the cost of a wage increase for Walmart, we use detailed data on Walmart workers’ starting wages and average pay in 2001 for 156 job titles from Richard Drogin’s analysis of Walmart payroll data. Wages are adjusted to 2010 dollars using average annual wages reported by Walmart. Although much of the variation in wages within the Walmart workforce is captured by the job-based wage distribution, each job category has workers earning at different levels. To capture this added variation within job titles, we use household level wage data from the March Current Population Survey (CPS), and assumptions based on existing estimates in the literature on within-company and between-company components of wage variance. We also use the March CPS to estimate the family income of Walmart workers by statistically profiling them based on their wage levels, gender, full-time status and industry of work. For a full description of the methodology, see Appendix A. The key finding of this report–that a higher wage standard at Walmart represents a progressive income redistribution even accounting for effects on consumers–is quite robust to a plausible range of assumptions we use in our analysis. Based on the distribution of wages for the Walmart workforce, we estimate that a $12 minimum wage would increase Walmart’s total payroll for hourly workers by 11.1 percent (Table 1). With a total hourly payroll of 28.9 billion for the company in 2010, this comes to $3.21 billion per year. About 41.4 percent of this increase would go to workers with family incomes below 200 percent FPL (Table 2). What would the raise to $12 per hour look like for the Walmart workforce? Walmart notes that its average hourly wage is $11.75 for full-time associates. However, not all employees earn the average. In fact, payroll data from 2001 suggests that there is a good deal of variation in hourly wages by gender, race and job title. 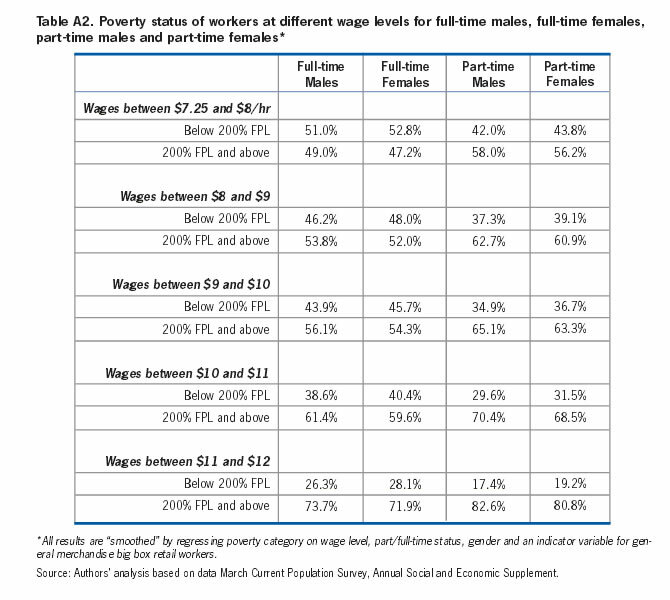 As shown in Table 3 (page 5), adjusted for current income, workers currently earning below $9 an hour would receive a 37 percent wage increase on average, depending on the number of hours worked. Those earning between $9 and $12 an hour would receive a 14 to 16 percent average wage increase. In dollar amounts, the wage increase to $12 per hour would result in $3,250 to $6,500 average annual pay increases for workers with wages below $9 an hour, and $1,670 to $2,640 average pay increase for workers with wages between $9 and $12 an hour. (The range reflects the difference between full and part-time workers). The post-tax increase would be lower for some workers that qualify for the Earned Income Tax Credit, depending on the precise family income level. Another important question to address is how a $12 per hour minimum wage would impact consumer prices charged by Walmart. It is not necessarily the case that Walmart would pass on the total cost of a wage increase to its shoppers through higher prices. Part of the cost could be absorbed through accepting a lower profit margin; leveling or reducing management salaries and bonuses; and through improved labor productivity due to increased effort, lower turnover, and lower absenteeism.8 To the degree that Walmart’s lower relative wages have led to greater opposition to the company’s expansion in urban areas, measures to respond to critics may improve the business climate for the company, opening new markets in urban areas and lessening the time needed to secure necessary zoning changes. For the purposes of this paper, however, we examine the outermost case of what would happen if Walmart were to pass the entire cost of the wage increase on to consumers. 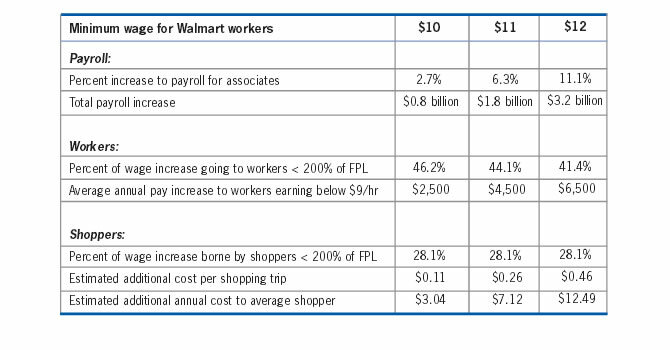 As we showed in the previous section, the cost for Walmart of a $12 per hour wage increase would amount to $3.21 billion a year in payroll costs, or 11.1 percent of Walmart’s current hourly payroll. 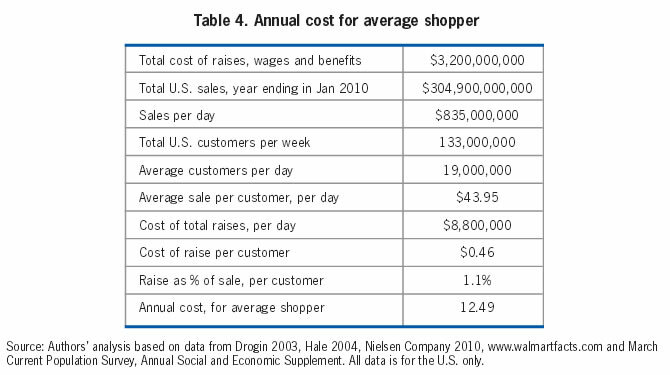 If we distribute this among all consumers, we find that it amounts to 46 cents per shopping trip for the average consumer, based on the annual sales and customer figures provided by Walmart for 2010 (Table 4, page 6). To estimate the impact per shopping trip, we use Walmart’s annual U.S. sales data and weekly customer data. We divide sales by 365 and customers by seven to get the average sale per customer per day. We then divide the total annual payroll increase by 365 to get the cost of the wage increase per day. Using Walmart’s figures on U.S. sales and customers, we find that the average customer spends $43.95 per shopping trip, and makes 27 shopping trips per year,9 spending $1,187 annually at the store (Table 4). The 46 cent increase amounts to a 1.1 percent increase in prices. For the average shopper, this would result in a price increase of $12.49 a year. The Nielsen Company provides a breakdown of Walmart shoppers by household income using its Homescan Consumer Panel. The panel consists of a sample of over 100,000 randomly selected households who use in-home scanning devices to record where they shop, what they buy, what they spend, and whether or not they used a coupon or took advantage of a store deal in their purchase of a product. Of the total households in the sample, 51,000 made at least one shopping trip to Walmart during the year. The Nielsen Company analysis shows how Walmart sales are distributed across shoppers from different household income brackets (Table 5, page 7). Data from the Current Population Survey allows us to estimate the share of shoppers in these household brackets who are in families below 200 percent FPL.10 By multiplying the percentage of sales of each income bracket by the fraction below 200 percent FPL, we estimate that 28.1 percent of Walmart’s sales are purchased by families earning below 200 percent of the federal poverty level. Should policy makers consider supporting legislation that would raise wages at Walmart? Should they be concerned that low-income shoppers will bear the cost if Walmart is required to increase its minimum wage to $12 an hour? Our data suggests that a $12 per hour minimum wage standard at Walmart would be effective in aiding lower-income families. If Walmart increased its minimum wage to $12 per hour, 41.4 percent of the income gain would accrue to workers with wages below 200 percent FPL. These low-wage workers could expect to earn an additional $1,670 to $6,500 a year in income. If Walmart passed on 100 percent of the wage increase to consumers through price increases, which is unlikely, the impact for the average Walmart shopper would be $12.49 a year (Table 6, page 8). We estimate that 28.1 percent of the impact of the price increase would be borne by shoppers with incomes below 200 percent FPL. Finally, we should consider the impact of a mandated wage increase on the economic viability of big box retailers. Some analysts suggest that Walmart could not just raise wages, and prices, given that it operates in a competitive environment. However, a living wage policy would require all large retailers to operate under the same standards. When a big box living wage policy was previously proposed in Chicago, Steve Hoch of the Wharton Business School argued that it was unlikely to have a negative impact on retailers or Chicago: "The standard argument by the retailer is that they can’t afford to do it, but if everybody has to, then the playing field is level." His argument is born out by recent research on the economic impacts of minimum wage and living wage ordinances. In conclusion, big box living wage laws provide a means of capturing the positive benefits to consumers of the big box retail model, while mitigating the negative impacts on workers. This report updates a 2007 Center for Labor Research and Education report, “Living Wage Policies and Walmart: How a Higher Wage Standard Would Impact Walmart Workers and Shoppers,” by Arindrajit Dube, Dave Graham-Squire, Ken Jacobs, and Stephanie Luce (December 2007). In order to estimate the effect of a $12 per hour minimum wage, one needs the distribution of wages for Walmart hourly workers. Despite multiple request, Walmart officials were not able to provide information on the wages beyond what can be found on their website. Fortunately, there are numerous other sources to provide wage distribution estimates. We use the Drogin13 data set as the basis for this estimate and the Current Population Survey (CPS) to understand the poverty status of the Walmart workers. The Drogin data contains the average pay in 2001 for 156 different job titles by gender and full-time/part-time hourly workers employed at the end of 2001. This results in 502 different “job categories” based on title, gender and full/part-time status. We increase the number of workers in each job category so that the total number of hourly employees equals 1,400,00014 and 65 percent are full-time while 35 percent are part-time.15 The average wage for each job category is “aged” to 2010 levels by a common growth rate. This rate was chosen to be such that the average wages for full-time hourly workers in the data set equal Walmart’s self-reported average wage for full-time hourly workers in 2010.16 We also know the starting wages (in 1998) of job categories with at least 1,000 employees (appendix 11a of the Drogin data). To bring these wages up to 2010 levels, we use three pieces of information: 1) from 1998 to 1999, we use the CPI to inflate wages as no other source is available; 2) from 1999 to 2001, we use the growth in average wages of hourly workers to inflate the starting wages; and 3) from 2001 to 2010, we use the 2010 wages of full-time hourly workers to estimate the growth in starting wages–analogous to the way in which we estimate the growth in average wages. For job categories where starting wages are not available we use $7.25, the federal minimum wage. The average and starting wages by job categories provide a rich description of pay-setting within Walmart. However, to estimate the cost increase from a $12/hour floor, we also require the wage distributions within each job category. We know the average wage in each of these jobs, but we also need to know something about the variance in wages within these detailed categories. Unfortunately, the Drogin data does not contain information about within-job variance in wages. To remedy this, we use a multi-step process that involves: 1) estimating the overall variance in wages for large general merchandisers using the CPS; 2) making an assumption about how much of this variance represents within-Walmart variance in wages; 3) backing out how much within-job within-Walmart variance must exist to produce the overall within-Walmart wage variance. 30 percent of the variance (or 55 percent of the standard deviation). Since Walmart’s wages are more than 20 percent lower than other large general merchandisers, a sizeable portion of the variance in wages of large general merchandise workers reflects between-firm differences. For this reason, within-Walmart wage variance is unlikely to be the source of the majority of the overall variance. However, as we show below in a set of robustness exercises, assuming a fraction much larger (say 80 percent of overall wage variance is within Walmart) does very little to the results; the intuition for this is that most of the variation in wages is already being captured by mean and starting wages of detailed job-based categories. Our assumption, then, is that the overall variance in wages for Walmart hourly workers is 0.3 * 34.02 = 10.21. If the overall variance in Walmart wages is 10.21, and the variance in wages by job category is 3.83, then the within-job residual variance is by definition 10.21 – 3.83 = 6.38. We further assume that the wages within each category are distributed lognormally, left censored at the starting wage for each job category. In other words, we estimate 502 separate lognormal distributions for the 502 different job categories, each of which has a separate mean and a common variance parameter. To arrive at estimates about the poverty levels of Walmart workers, we estimate the likelihood of being poor or near poor by wage categories as well as demographic information using the Current Population Survey. Fundamentally, we assume that the poverty status of workers at Walmart will be the same as workers at general merchandise retailers with more than 1,000 employees, conditional on wages, gender and full/part-time status. Using wage categories of $7.25–$8, $8–$9, $9–$10, $10–$11, and $11–$12, we determine the percentage of workers below 200 percent FPL for each wage category. The Walmart job categories are based on gender full/part-time status so we compute different percentages for females working part-time, females working full-time, males working part-time and males working full-time. We apply these percentages to the Walmart wage data to determine which portions of a hypothetical wage increase (of $12/hour minimum) would go to workers in the different poverty levels. Due to the small number of workers in general merchandise big box retail in the March CPS we use two techniques to improve our estimate of the workers below 200 percent FPL. First, we combine the March CPS over six years, from 2005 to 2010, adjusting wages by the CPI so that workers’ earnings are in 2010 dollars. Next, we statistically estimate the fraction of general merchandise workers below 200 percent FPL by using linear regression. We predict whether a worker is below 200 percent FPL by four categorical variables: wage level ($7.25–$8, $8–$9, $9–$10, $10–$11, $11–$12, above $12), gender, part-time/full-time status and a binary variable to indicate an individual works for a large general merchandise employer. This model is estimated using the CPS sample of all retail workers earning less than $16 per hour. This model is then used to predict the probability of large (employers with 1,000 or more employees) general merchandise workers of being below 200 percent FPL based on wage level (see table A2, page 12). To check for the robustness of this statistical model, we repeat the regression with three of the four dependent variables interacting with the indicator variable for large general merchandise workers. This makes very little change in our final results; the fraction of the wage increase going to workers below 200 percent FPL changes by 0.3 percentage points, from 41.4 percent to 41.1 percent. In order to make overall workers more representative of Walmart’s workforce the sample is re-weighted to make each state’s percentage of large general merchandise workers equal each state’s percentage of Walmart hourly workers. In this report we define poor and low-income families as having incomes below 200 percent FPL. 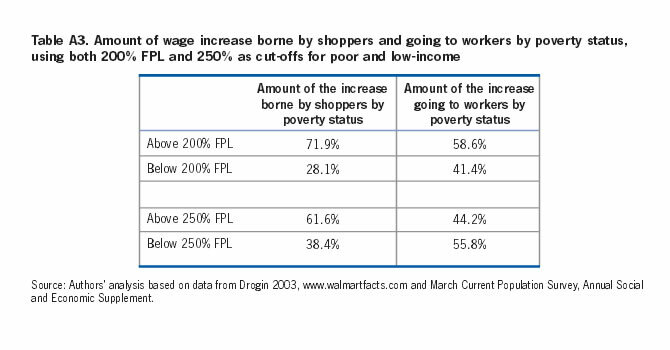 Below we show the differences between the amount of the increase borne by shoppers and the amount of the increase going to workers if we increase our poverty grouping to 250 percent FPL (see Table A3, page 13). With 200 percent FPL as a cut-off, the percent of the increase borne by low-income shoppers, at 28.1 percent, is roughly 2/3 of the percent of increase going to low-income workers, at 41.4 percent. We see a similar ratio when 250 percent FPL as is used. The share borne by low-income shoppers is 38.4 percent while the share going to low-income workers is 55.8 percent. Finally, we use the estimated poverty level of Walmart workers to simulate the effects of $12/hour minimum pay. As each worker (by job category) is brought up to $12/hour, the wage increments are multiplied by the odds of that worker being under 200 percent of FPL. As discussed earlier, we utilize a number of modeling assumptions to arrive at the poverty levels of Walmart workers currently earning less than $12/hour. In this section, we report a number of robustness checks to see how sensitive our final estimates are: 1) assumption about the fraction of wage variance of general merchandise workers that reflects variance of Walmart wages; 2) estimates of the residual wage variance by detailed job categories, as opposed to more aggregate ones. First, instead of assuming that the standard deviation for Walmart worker wages would equal 30 percent of the variance of wages (or 55 percent of the standard deviation of wages) for workers in general merchandise retail with firm sizes of more than 1,000 people, we choose alternative fractions: 20 percent, 30 percent, 50 percent and 80 percent. Setting Walmart to 80 percent of the wage standard deviation raises the payroll increase from 11.1 percent to 13.0 percent. But it has a smaller impact on the fraction of the wage increase going to poor and low-income workers (this amount changes from 41.4 percent to 45.2 percent). Intuitively, the reason this does not make much difference is because the residual variance within jobs plays a small role when between-job variance and left-censoring by starting wages by job categories are already incorporated. Second, we estimate a more “parsimonious” distribution of wages for Walmart workers. We perform the same analysis with all workers in just four job categories by part-time/full-time status crossed with gender (using four log normal distributions). In other words, starting from our finding that overall Walmart variance in wages is 0.3*34.02=10.21, we now fit four log normal distributions (as opposed to 502 different ones by job categories) with censoring at the weighted average of starting wages for all hourly workers within each category. This changes the results only slightly as the payroll increase lowers to 11.0 percent (from 11.1 percent for all 502 job categories). Overall, the results suggest that our main findings are quite robust to alternative modeling assumptions for Walmart’s wage distribution. Data on shoppers’ household income comes from The Nielsen Company using its Homescan Consumer Panel. The panel consists of a sample of over 100,000 randomly selected households who used in-home scanning devices to record where they shop, what they buy, and what they spend over the 52-week period ending September 25, 2010. Of the total households in the sample, 51,000 made at least one shopping trip to Walmart during the year. To find the percentage living in poverty, we use the March 2005-2010 Current Population Survey ASEC. In order to make overall consumers more representative of Walmart consumers, the sample is re-weighted to make each state’s percentage of U.S. households equal to each state’s percentage of U.S. Walmart stores. The March CPS data is inflation adjusted so it reflects information for the 2010 year, which corresponds to the Nielsen data. Total sales come from Walmart annual reports. Walmart serves 200 million customers worldwide every week18, but does not provide the fraction of the customers in the U.S. To estimate this we use the fraction of U.S. sales associates (1.4 million) to the number of worldwide sales associates (2.1 million) to estimate that 2/3 of Walmart customers are from the United States.19 This results in an estimate of 133 million U.S. customers each week. As international Walmart stores may be more labor intensive, thereby requiring more employees per customer, we may be underestimating the number of weekly U.S. customers. If so, the wage increases to workers would result in a lower cost per shopping trip, and per year, to the average Walmart shopper. Impact of differing minimum wages Below are the main findings at lower minimum wage levels, compared to the $12 wage floor used for the report. Basker, Emek. 2005. “Selling a Cheaper Mousetrap: Walmart’s Effect on Retail Prices.” Journal of Urban Economics 58: 203-229. Basker, Emek. 2007. 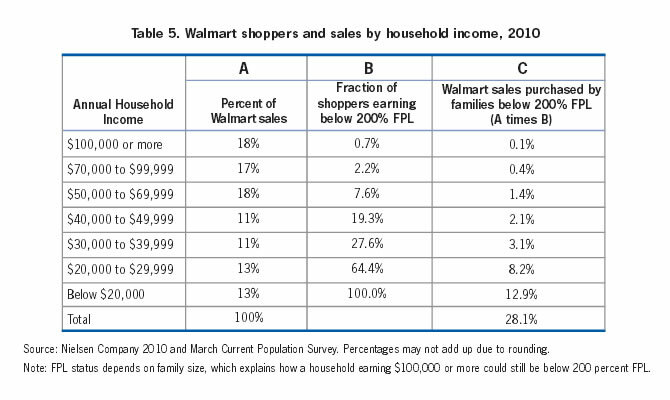 “The Causes and Consequences of Walmart’s Growth.” University of Missouri Working Paper No. 06-11. Available at SSRN: http://ssrn.com/abstract=950882. Bernstein, Jared, L. Josh Bivens and Arindrajit Dube. 2006. “Wrestling with Walmart: Trade-offs between Profits, Prices and Wages.” EPI Working Paper. Washington, DC: Economic Policy Institute. Bernstein, Jared and L. Josh Bivens. June 15, 2006. “The Walmart Debate: A False Choice between Prices and Wages.” EPI Issue Brief #223. Drogin, Richard. February 2003. “Statistical Analysis of Gender Patterns in Walmart Workforce.” Submitted as expert report in Dukes v. Walmart Stores, No. C 01-02252 MJJ (N.D. Calif.). Wage information was obtained from appendices 4a and 8a and average starting wages from appendix 11a. Dube, Arindrajit and Ken Jacobs. 2004. “Hidden Cost of Walmart Jobs: Use of Safety Net Programs by Walmart Workers in California.” http://laborcenter.berkeley.edu/retail/walmart.pdf. Dube, Arindrajit, T. William Lester and Barry Eidlin. August 2007. “Firm Entry and Wages: Impact of Walmart Growth on Earnings Throughout the Retail Sector.” http://papers.ssrn.com/sol3/papers.cfm?abstract_id=841684. Dube, Arindrajit, T. William Lester and Barry Eidlin. November 2007. “A Downward Push: The Impact of Walmart Stores on Retail Wages and Benefits.” Available at http://laborcenter.berkeley.edu. Dube, Arindrajit and Steve Wortheim. 2005. “Walmart and Job Quality: What Do We Know, and Should We Care?” http://laborcenter.berkeley.edu/retail/walmart_jobquality.pdf. Engardio, Pete. January 29, 2007. “Beyond the Green Corporation.” BusinessWeek, issue 4019. Fairris, David, David Runsten, Carolina Briones and Jessica Goodheart. 2005. “Examining the Evidence: The Impact of the Los Angeles Living Wage Ordinance on Workers and Businesses.” http://www.losangeleslivingwagestudy.org/docs/Examinig_the_Evidence_full.pdf. Furman, Jason. November 28, 2005. “Walmart: A Progressive Success Story.” Unpublished paper. http://www.americanprogress.org/kf/walmart_progressive.pdf. Global Insight. 2005. “The Economic Impact of Walmart.” Report prepared for Global Insight conference on Walmart. Hale, Todd. 2004. “Understanding the Walmart Shopper.” Consumer Insight. Spring: 29-33, 44. Hausman, Jerry and Ephraim Leibtag. 2005. “Consumer Benefits from Increased Competition in Shopping Outlets: Measuring the Effect of Walmart.” Working paper submitted to Global Insight conference on Walmart. Hudson, Kris. October 25, 2005. “Walmart Investors Fret Over Cost.” Wall Street Journal, Section C: 3. Knowledge@Wharton. 2006. “What Impact, If Any, Will Higher Minimum Wages Have on Retailers and Low-income Workers?” Available at http://knowledge.wharton.upenn.edu. Neumark, David, Junfu Zhang and Stephen Ciccarella. 2005. “The Effects of Walmart on Local Labor Markets.” http://www.econ.ucdavis.edu/seminars/papers/106/1061.pdf. Nielsen Company. 2010. Profile of the Walmart Shopper. From the Homescan Consumer Panel for the 52-week period ending September 25, 2010. Pew Research Center. December 15, 2005. “Walmart a Good Place to Shop But Some Critics Too.” News Release. http://people-press.org/reports/pdf/265.pdf. Reich, Michael, Peter Hall and Ken Jacobs. 2005. “Living Wage Policies at the San Francisco Airport: Impacts on Workers and Businesses.” Industrial Relations 44 (1): 106-138. Sherk, James and Rea S. Hederman, Jr. 2007. “Who Earns the Minimum Wage? Suburban Teenagers, Not Single Parents.” Heritage Foundation. WebMemo #1320. Strasser, David and Camilo R. Lyon. 2007. Bank of America March 8, 2007 Retailing Report on Walmart Stores, Inc.
We are indebted to Arindrajit Dube for his work as a co-author of the original 2007 report. We appreciate the helpful comments and reviews we received from Annette Bernhardt, Mark Brenner, David Howell, Steven Pitts, and Paul Sonn. Molly Hagan’s assistance with the Nielsen data is also appreciated. Thanks to Jenifer MacGillvary and Rebecca Graham for proofreading and layout. This research was funded in part through a contribution from American Rights at Work. Arindrajit Dube and Steve Wertheim. “Walmart and Job Quality: What Do We Know and Should We Care?” October 2005. Arindrajit Dube, T. William Lester and Barry Eidlin. “Firm Entry and Wages: Impact of Walmart Growth on Earnings Throughout the Retail Sector.” August 2007; David Neumark, Junfu Zhang and Stephen Ciccarella. “The Effects of Walmart on Local Labor Markets.” October 2005. Arindrajit Dube and Ken Jacobs. “Hidden Cost of Walmart Jobs: Use of Safety Net Programs by Walmart Workers in California.” August 2004. Jerry Hausman and Ephraim Leibtag. “Consumer Benefits from Increased Competition in Shopping Outlets: Measuring the Effect of Walmart.” 2005. Emek Basker. “The Causes and Consequences of Walmart’s Growth.” 2007. The Pew Survey found that 53 percent of respondents with annual earnings under $20,000 reported regularly shopping at Walmart, compared with 33 percent of those with annual incomes above $50,000. (Pew Research Center 2005). Note that the Pew data does not control for the reasons shoppers gave for frequently shopping at Walmart; it is possible that low-income shoppers shop more regularly at Walmart because they have fewer stores to choose from, or may lack transportation to reach other stores as easily. Consumer data collected by Neilson shows that those surveyed say that their main reason for choosing Walmart was location (34 percent). Twenty-five percent of respondents say their main reason is low prices (Hale 2004). Jason Furman. "Walmart: A Progressive Success Story." November 28, 2005. Michael Reich, Peter Hall and Ken Jacobs. “Living Wage Policies at the San Francisco Airport: Impacts on Workers and Businesses.” 2005; David Fairris, David Runsten, Carolina Briones and Jessica Goodheart. “Examining the Evidence: The Impact of the Los Angeles Living Wage Ordinance on Workers and Businesses.” 2005. A Bank of America analysis estimates that the after-tax impact of a $0.50 per worker wage increase by Walmart would be $0.013 earnings per share. David Strasser and Camilo R. Lyon. Bank of America Retailing Report on Walmart Stores, Inc. March 8, 2007. While little research has been done on the impact of reputation on stock price, Communications Consulting Worldwide suggests that in the case of Walmart it could be significant. Pete Engardio, “Beyond the Green Corporation,” BusinessWeek. January 29, 2007; Jared Bernstein and L. Josh Bivens. “The Walmart debate: A false choice between prices and wages.” June 2006. Todd Hale, “Understanding the Walmart Shopper.” 2004. To find the percentage living in poverty, we use the March Current Population Survey ASEC (Table 6). In order to make overall consumers more representative of Walmart consumers, the sample was re-weighted to make each state’s percentage of U.S. households equal to each state’s percentage of U.S. Walmart stores. Richard Drogin. "Statistical Analysis of Gender Patterns in Walmart Workforce." February 2003. Authors’ analysis of hourly workers in large general merchandise retailers from the 2005-2010 March Current Population Survey where full-time is defined as working 34 or more hours per week. Sample weights were adjusted on a state-by-state basis to represent the fraction of Walmart associates in each state. From the website http://walmartstores.com/download/2230.pdf, the average, full-time hourly Walmart employees earned $11.75/hour in 2010. In 2001 the average earnings for full-time hourly employees in the Drogin data was $9.10/hour. Thus the wages for all job titles for each gender and for full and part-time workers was increased by 11.75÷9.10, or 29.1 percent. Dube and Wortheim (2005) estimate that Walmart constitutes 55% of all general merchandise workers and 71% of large general merchandise workers. Labor and Living Wage Advocates Thwart Wal-Mart in D.C.
Fast Food Workers Strike – Is a Living Wage Really Possible? Commentary: Could Walmart Pay a Living Wage?